US Ambassador David Friedman offers condolences to families of 10 Israeli teens killed by flash flood. 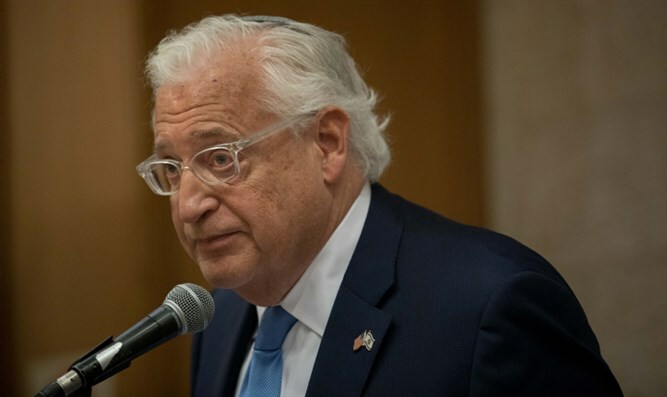 US Ambassador to Israel David Friedman offered his condolences Friday afternoon to the families of the 10 Israeli teenagers who perished Thursday afternoon in a flash flood in southern Israel. “Rain in Israel is a blessing,” Ambassador Friedman tweeted. Twenty-five Israeli teenagers were hiking in Nahal Tzafit Thursday afternoon when a flash flood hit, killing 10 of the hikers and injuring two more. Earlier on Friday, authorities released the identities of the last of the victims of Thursday’s tragic flood. The victims were all between the ages of 17 and 18, and included nine girls and one boy. The names of the victims are as follows: Ella Or from Maale Adumim, Tzur Alafi from Mazkeret Batya, Yael Sadan from Jerusalem, Mayan Barhum from Jerusalem, Gali Balali from Givatayim, Agam Levy from Moshav Herut, Romi Cohen from Moshav Maor, Shani Shamir from Shoham, Ilan Bar Shalom from Rishon Letzion, and Adi Raanan from Mikhmoret. The hike had been held as a bonding exercise for incoming students at the Bnei Tzion pre-army preparatory academy in Tel Aviv. On Thursday, police spokeswoman Meirav Lapidot said school administrators okayed the hike despite flood warnings and instructions by police not to travel in the area. "The group of youths went on a trip to Nahal Tzafit despite our repeated warnings not to travel in the southern valleys," Lapidot told the Reshet Bet radio station. On Friday, police detained three officials from the Bnei Tzion academy for questioning. Two of the three, including the school’s headmaster, were later placed under arrest. A third official was released to house arrest. Southern Israel was hit by heavy rains Wednesday and Thursday, forcing closures at Eilat Airport. Flooding in the Arava region forced the closure of Route 90 up to and including the Dead Sea area. A truck hit by a flash flood was found in the Arava region overnight, though the driver remains missing.